Dianella tasmanica, or Tasman Flax Lily, has beautiful variegated foliage that is grass-like in habit. It’s striking foliage is a beautiful addition to shady and part sun landscapes. In summer, Tasman flax lily produces stalks of dainty lavender flowers atop the foliage. Following the flowers are metallic blue berries that provide additional interest against the striking foliage. Plants versatile, and can be planted into borders, bed edges, and even containers. Tasman Flax lily has medium to moderate water needs, especially during the heat of the summer. Typically pest and disease free, Tasman Flax Lily is a great choice for low maintenance landscapes. Once established, divide occasionally as they have a clumping habit and can become dense. In cooler zones Tasman Flax Lily may go completely dormant and is deciduous. 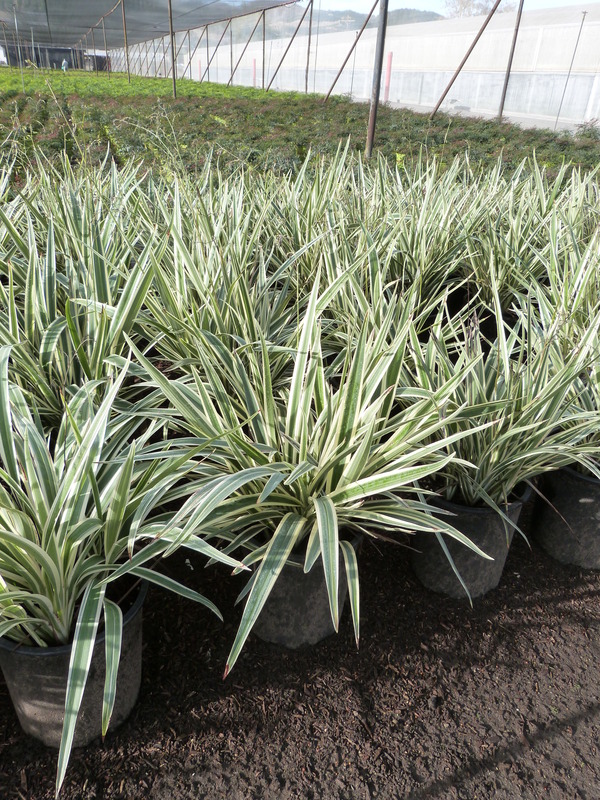 In warmer zones, foliage remains above ground and does not require cutting back. Tasman Flax lily prefers well draining slightly acidic soil, so be sure to amend landscape beds accordingly.